Scotland start the knock out phase of the World Mixed at 12.00 noon today against Spain. They were in the same section as Spain, and had a 9-7 victory over them, earlier this week. Last 3 games in the section have been played , not the highest quality but the results were all we required. Now we need to get a favourable draw in the last 16 . Canada, Sweden, Czech and USA all look good and,Korea, China, Russia are all professional teams ,so lots of danger ahead, fingers crossed. Win against Denmark puts Scotland back on track. Earlier, after we dominated most of the game against Korea, Grant's last hit cleared everything in the house except a Korean red and the first defeat was delivered, but still pleased with the performance against one of the pro teams. Scotland started their campaign yesterday with a 9-7 victory over Spain and followed that with a 9-2 win against Ireland. A score of three in end 3 folllowed by a steal of 2 in end 4 set up the win. Billy Morton and Barbara McFarlane are the front end for Grant Hardie's team representing Scotland in the World Mixed Curling Championships. Rhiann Macleod is third. There are 5 groups and the Scots are in Group C along with 7 other teams. Play commences tomorrow, Friday 6th October and the top 16 teams will play next Friday in the play offs. All the details and results can be found by clicking here. 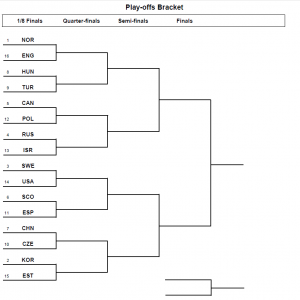 TV broadcasts will be on World Curling TV channel from the quarter final stages. Luckily, Gavin and Jean Morton have promised to send reports of life in Champery during the week. They have started by sending these photos of the travel options.